The Sanskrit word 'yantra' derives4 from the root 'yam' meaning to sustain, hold or support the energy inherent in a particular element, object or concept. In its first meaning, 'yantra' may refer to any kind of mechanical contrivance which is harnessed to aid an enterprise. A yantra in this sense, therefore, is any sort of machine or instrument such as is used in architecture, astronomy, alchemy, chemistry, warfare or recreation. A Sanskrit text of the eleventh century AD, Samaranganasutradhara, on the science of architecture, gives vivid descriptions of the making and operating of such mechanical yantras as a wooden flying bird, wooden aeroplanes meant to fly with hot mercury as fuel, male and female robot figures, etc. The vast observatories built in Delhi and jaipur under the patronage of jai Singh (1686-1734) are called jantar-Mantar, as their massive structures are astronomical 'instruments' (yantras) for recording heavenly phenomena. The meaning of the term yantra has been expanded to refer to religious enterprises, and has acquired a special theological significance. 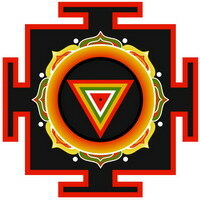 Mystic yantras are aids to and the chief instruments of meditative discipline. Basically a yantra used in this context and for this purpose is an abstract geometrical design intended as a 'tool' for meditation and increased awareness. Mystic yantras are an amalgam of three principles: the form principle (Akriti-rupa), the function-principle (Kriya-rupa), and the power-principle (Sakti-rupa). They are, first of all, believed to reveal the inner basis of the forms and shapes abounding in the universe. Just as, whatever the outer structure, all matter is made of an intrinsic basic unity, the atom, so each aspect of the world can be seen in its structural form as a yantra. As the scientist sees the final picture of the world in the orderly, simple, atomic structures in which certain primal shapes appear as a harmonized 'whole', so the Indian shilpi-yogins (makers of ritual art) seek to identify the innermost structure of the universe by concentrating the variegated picture of world-appearances through intense yogic vision into simple form-equations. 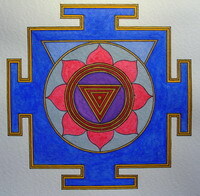 A yantra, then, can be considered an ultimate form-equation of a specific energy manifesting in the world. These simple form-equations are held to epitomize the real nature of the cosmos as abstracted from the concrete. 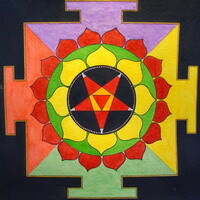 In its widest application, Akriti-rupa refers to the inner or hidden form of structures, so that any structure, from an atom to a star, has its Akriti-rupa yantra. Thus a flower or a leaf has an outer structure which is immediately perceptible, but it also has an inner form, which generally consists of a skeletal framework in which all its linear forms intersect with a central axis or nucleus: all forms have a gross structure and a 'subtle' inner structure, with a basic causal pattern (the inner form) for the external form. Yantras function as revelatory symbols of cosmic truths and as instructional charts of the spiritual aspect of human experience. 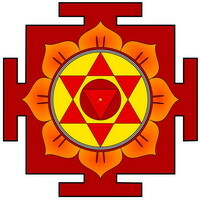 All the primal shapes of a yantra 30 are psychological symbols corresponding to inner states of human consciousness, through which control and expansion of psychic forces are possible. It is for this reason that a yantra is said to embody a 'function-principle' (Kriya-rupa). By constant reinforcement in ritual worship the apparently inert yantra-forms shake off their dormancy and act together as emblems of psychic power. In this case, the yantra is said to move beyond 'form' and 'function' and emerges as a 'power diagram' (Sakti-rupa) endowed with a self-generating propensity to transform a mundane experience into a psychic one. It is at this point that the yantra is said to be 'revealed'. Although its outward meaning may be relatively easy to understand, the inner meaning that gives it its efficacy is difficult to grasp because its archetypal forms are basically concerned with the inner facts of psychic experience, gained through intuitive vision.